This is another viral type post on social media. It is reportedly the largest Eastern Brown Snake ever recorded in one version of the tale. The length of an average size brown snake is about 5.5 feet but this monster is said to be 15 foot long! The social post claims it was caught near a golf course at Caloundra, Queensland, Australia. The post about the snake is normally accompanied by 2 or 3 photos and the message "Golf anyone?" 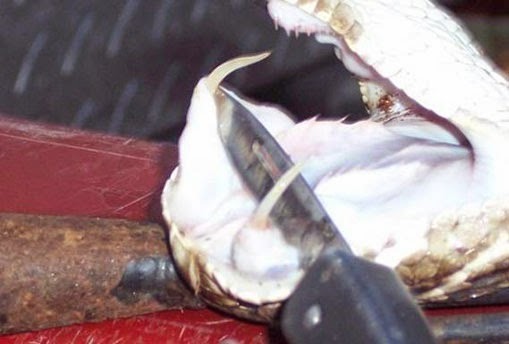 Two of the photos are the one above and a close up of the snake's mouth and teeth. 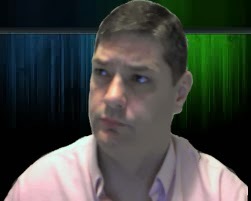 Here is that photo. 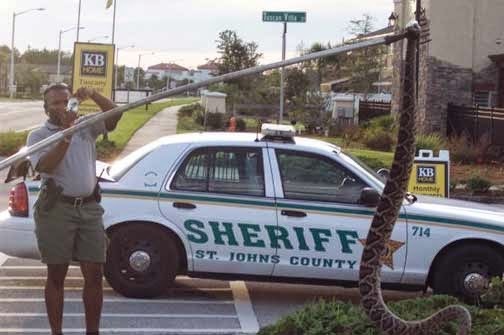 The other version of the story is of a 15 foot Eastern Diamondback rattlesnake being caught south of Jacksonville, FL. As you can see this is very scary, but is it Real or Fake? There is a dual answer here, the photos are for sure REAL but in the Australian version it claims to be a Brown snake and that it's from Australia . Both of these claims are FAKE. The snake featured in the social media post is a Eastern Diamondback rattlesnake that was actually caught at St. Augustine, Florida back in 2009. The snake was only about 7 foot long and not 15 foot as the post claims. Of course the snake does look really large but that is due to forced perspective. 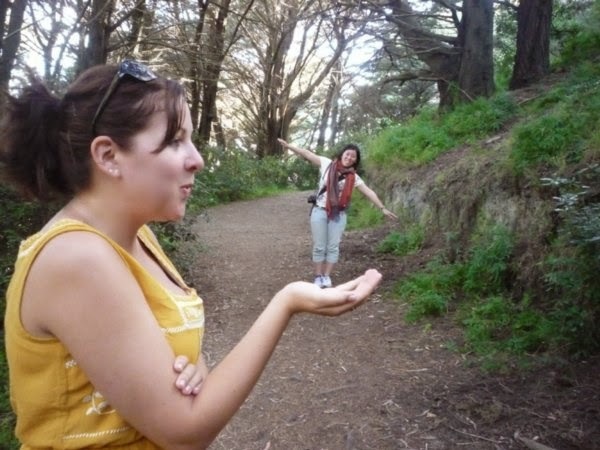 The forced perspective technique manipulates our human perception with the use of optical illusions to make objects appear larger, smaller, farther, or closer than they actually are. Here is an example. The photos of the snake are REAL but the size and stories about them are mostly FAKE. In the American version some of the statistics about the snakes, including weight, are pulled out of the air. 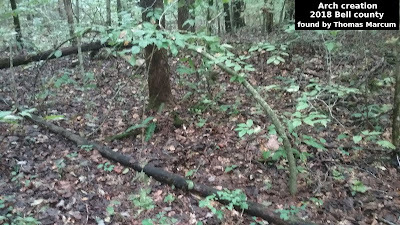 Bigfoot in Mississippi - UPDATE!! Real or Fake - Flying Spider Invasion!